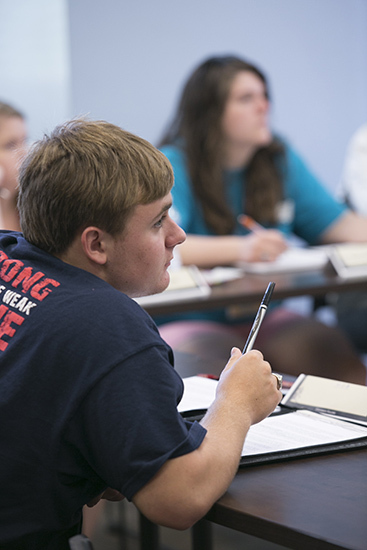 The Samford University Fellows program has hosted two summer programs to give rising high school juniors and seniors a preview of the college experience at Samford while simultaneously challenging them intellectually. The Great Ideas Summer Institute (GISI) held its first session last week and began its second and final session on July 12. The other program, the Quantitative Finance Summer Institute (QFSI) held its only session last week. Students could not attend both in the same week, but they did have the option of participating in QFSI the first week and GISI the second week. Bryan Johnson, University Fellows director, said the two programs have similar daily schedules, with two classroom sessions each morning and one in the late afternoon. Samford faulty facilitate these discussion-oriented sessions, encouraging students to explain and defend their own ideas. GISI is a textual discussion course following the theme of “Greece, Rome, and the Roots of the American Republic.” This is the fifth year the Fellows have hosted this program. “Students read great texts from ancient Greece and Rome and talk about how those ideas helped develop the American Republic,” Johnson said. QFSI is in its second year of existence and focuses on the quantitative and analytical methods used in modern finance. This includes statistics, stock analysis, trading strategies and much more. Nine University Fellows students also help run the programs, doing everything from teaching portions of the classes to assisting in the residence halls. University Fellow and junior Jordan Holland assisted with QFSI last week, and he believes the program educates attendees about finance in a way that most other high school students will never experience. In-the-classroom education, however, is only a portion of the experience the University Fellows hopes to give attendees, Johnson said. From Sunday to Friday, students stay in campus housing, eat in the cafeteria and go on off-campus trips. This year’s trips included visits to a Birmingham Barons game, the Birmingham Museum of Art and the Birmingham Civil Rights Institute. Laura Ann Prickett, a University Fellow and senior, said trips like these greatly enhance students’ experiences. The final GISI session concludes Friday, July 17.